Side Note – I have labeled it preserves in the past but a little research shows that I make jams! 2.Jam is made from chopped or crushed fruit. 3.Preserves are made from whole chunks of fruit. 4.Jam contains sugar, pectin, and lemon juice. 5.Preserves are only boiled in sugar. 6.Jam is allowed to jell. 7.Preserves are not jelled in the process of manufacturing. It’s not that I do anything out of the ordinary to make my “jams”, other than the fact that every berry in the process is/was hand selected by me! In fact, 75% of the strawberries originate in my garden although I do supplement with strawberries picked, again, by me, at “Wood Duck Farm”, about 25 minutes north of Kingwood. They are grown, as are mine, with no chemicals of any sort. Laying out some of the tools of the trade. Four cups of sugar minus 1/4 cup mixed with the pectin prior to cooking. I use the Sure Jell pectin for my jams, they are made with 1/3 less sugar than with regular pectin. A spoon to skim the foam and yes I rinse it off after every lick. Green handle magnet to save my pinkies. An 8 ounce ladle…It does help when filling 8 ounce jars. Jar tongs….indispensable for fishing jars out from the boiling hot water just prior to filling. Last but not least, my trusty old, at least 35 years old, canning funnel. The start of the process; 1/4 cup sugar mixed with pectin and the measured volume of crushed strawberries, just a note here, follow the recipe very darned close!!!!! Too much of the fruit mixture or too little will impact the final results. I use a potato masher to, yes, mash up the fruit, so there are some nice chunks of berry in every jar, a dab of butter to help reduce the foaming. FYI – Not sure if it helps all that much but I can’t argue with the success of the final product. Follow the recipe; bring the mixture to a full rolling boil, i.e., cannot be stirred down. Note the light pinkish foam around the edges. Then add remaining sugar – 3 and 3/4 cups, return to full rolling boil for one minute….I just slowly count to 75 and it seems to work for me. Skim the foam but don’t discard. You have several choices, place in a bowl, refrigerate and use as you would any jam or preserve, or, as my wife does, spread across an egg white & oatmeal frittata, or dig in with a spoon and place directly into your mouth…..my personal favorite! Ready to can, foam has been skimmed, jars are in a boiling water bath for sanitation purposes, ladle and funnel are ready, magnetic stick finger saver, spoon (recently licked and rinsed properly)….use however you want and the jar lids in a bowl of very hot water to soften the seals. Grab a hot jar, drain and fill to about 1/4 inch of the topic the jar with the strawberry jam mixture. FYI, there is a tool made to gauge that space but I rarely use it, wipe any excess Jam from rim of the jar, place the lid on and screw the metal band on snuggly. Once all the jars are filled and sealed, return to the hot water bath, submerge the jars with at least one inch of water covering the jars. Bring to a boil for 10 minutes, remove and allow to cool. If you have done a good job you will hear the lids pop down as the jars cool, indicating s good seal. Next step, distribute and bring smiles to the faces of the recipients! First part of the move was to finish emptying the left bin and spreading the compost/mulch where needed. I love to smother the weeds in layer upon layer of mulching materials and then let the worms takeover working it into the soil. I am essentially a “no till” guy now. Besides, the thick layers make any successful weed long and leggy and very easy to pull. The left side was full at the end of the Fall leaf season and was slowly pulled out, layered between grass clippings on the right and spread throughout the spring and early summer as mulch. The right side has been gathering all my grass clippings, banana stems & stalks, coffee grounds and whatever else my composting worms don’t get. I spread several trash “barrelfuls” of the good stuff around my sad looking lime tree, I thought it succumbed to hard freeze in January, and the recovering dwarf Meyer Lemon. The lime tree sent several new limbs up from above the graft post freeze so, I selected a stout one to someday become the trunk of the little tree. In my last post I talked about planting more beans, pole beans to add some detail. 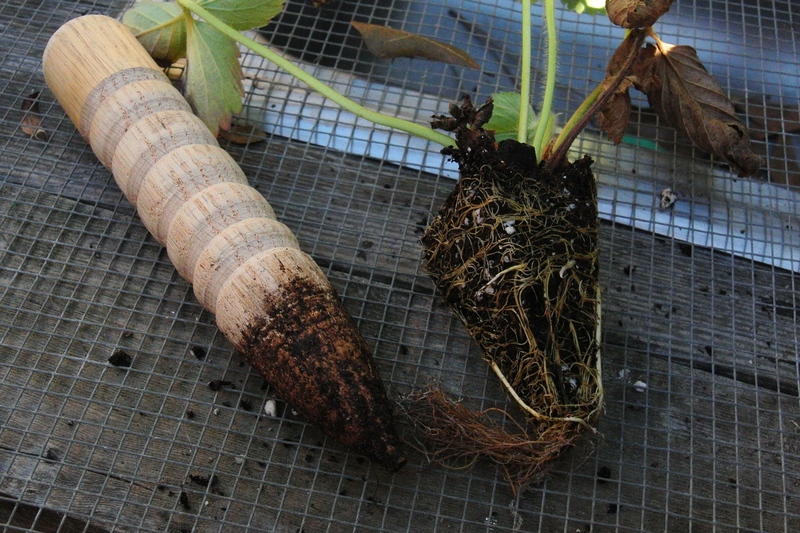 The previously planted beans were not pole beans…..I guess I should have read the package a little more closely. 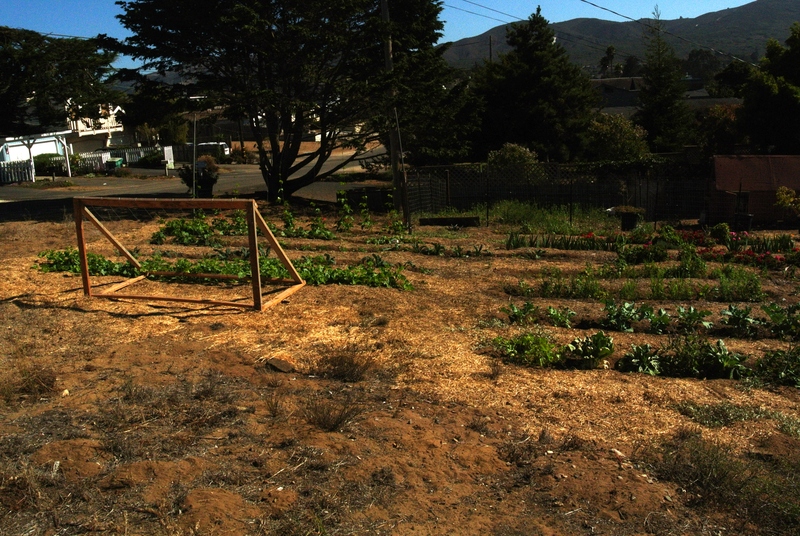 I try to minimize bending over to pick stuff….strawberries are an exception, oh, and carrots and beets get a pass too. I grow mostly stuff that I can pick in a mostly upright position. Bees, bananas and some clutter in the background. I smothered most of the existing bush beans, watered in the compost readying the ground for the pole beans. I grow them tepee style. I also do a “minimal labor” style of managing my composting. The bin of the right will be “moved”, probably over the course of several hot, humid, yucky, disgustingly sticky days. No hurry, I just need it emptied before the fall. The last 18 inches or so will be some well aged compost begging to be spread, hopefully around the mounds of potato plants soon to emerge. The title is just a bit misleading…. Update, as of July 27th, 2/3 of the right been has been moved to the left bin. 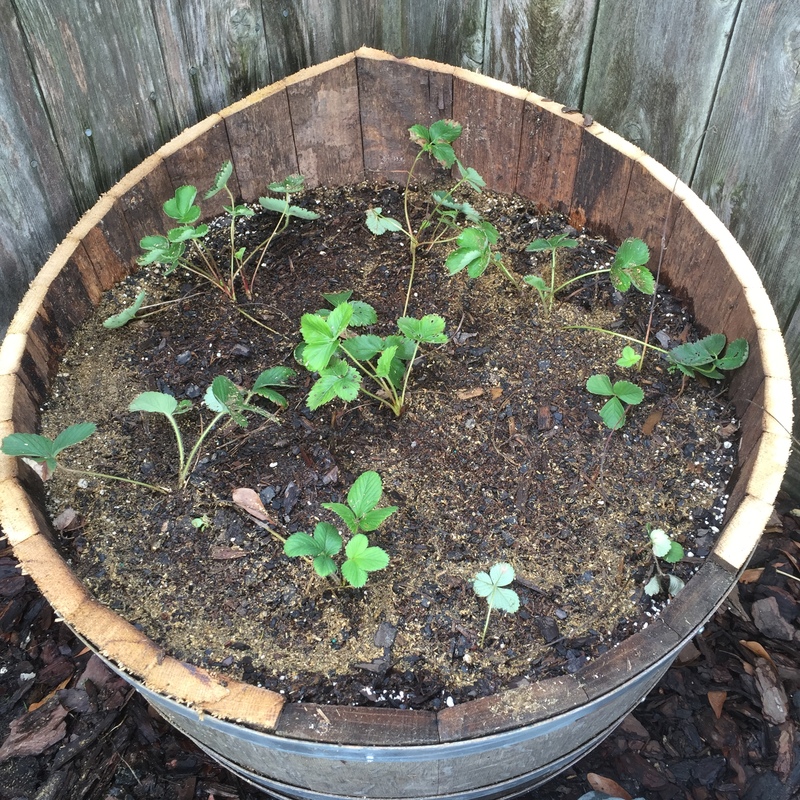 The bottom third is looking a lot like finished compost….Yee Haw! The garden is pretty quiet right now. I have a potted Juliet tomato that just keeps on producing, a few pole beans from a volunteer Kentucky Blue wonder variety and now the carrots and beets are popping up. Oh yes, and a large bunch of Burro bananas – hopefully it will be another mild winter and they will fully mature. About every other day I pick a handful just like this….picked these on November 22nd! The plant is still loaded. Now for the bees. I visited my remaining topbar hive yesterday. Nice sunny day and warm enough to open it up. This hive is the remnant of the colony I rescued over a year ago from a downed tree near downtown Houston. They split themselves several times, I split out a queen cell and a few frames into another topbar, robbed a queen cell for a queenless Langstroth hive and harvested about 4 bars of honey from the original. They have been gentle and prolific. I last opened this hive in early October and they had pulled comb back to about the 18th bar. I had intended to move the divider up and shrink the hive for winter but was then distracted and didn’t return. Now, on November 22nd I open it up and they have pulled comb back to about bar 24. Nothing put away at the back end but nice looking comb. I brought six empty bars and intended to remove any empty comb as I slid the divider forward. In hindsight I could have pulled 10 bars of drawn comb…..next time. A little peek inside before removing some pulled comb. I really don’t lean like that ….. all the time. Daughter Ashleigh loves angled photos. I worked my way up into the front third before finding brood. Some pretty good honey stores but lighter than I want so I am still giving them a little heavy syrup until it becomes too cold. A little closer look. About what I would expect for this time of the year. Son Joe getting a lesson on lighting the smoker. Joe, keeping his distance as I start the inspection. Ashleigh doing the selfie thing with Joe and myself geared up and ready to go. 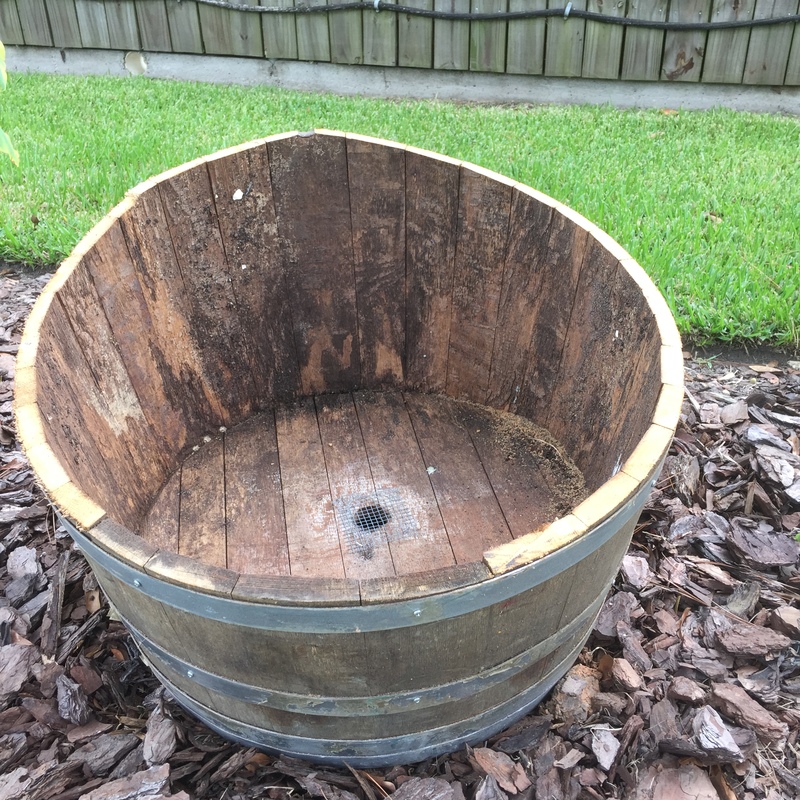 The first reuse of the wine barrel was a rotating composter built for me by my daughter Ashleigh and son Ben. It was a gift for Father’s Day, June 16, 2013. It was well appreciated. As a compost tumbler it was a mechanical success but lacked the volume to be an effective creator of compost. The Houston wet weather finally wreaked havoc on the support stand but left the barrel intact. So, Ashleigh and Ben, your gift has been repurposed and is still fondly remembered as the Father’s Day gift you had intended – something useful in my garden! After securing the metal bands with a few extra screws, I sawed the barrel in half starting at the compost tumbler door. I did salvage the hardware for a future project. I made the cut such that the back side was a bit taller than the front lip. See photo below. You can see the darkened wood where the door was. Trust me, the backside is taller than the front lip. The barrel had a rod run through it so that it could rotate. The hole make a great drain hole. 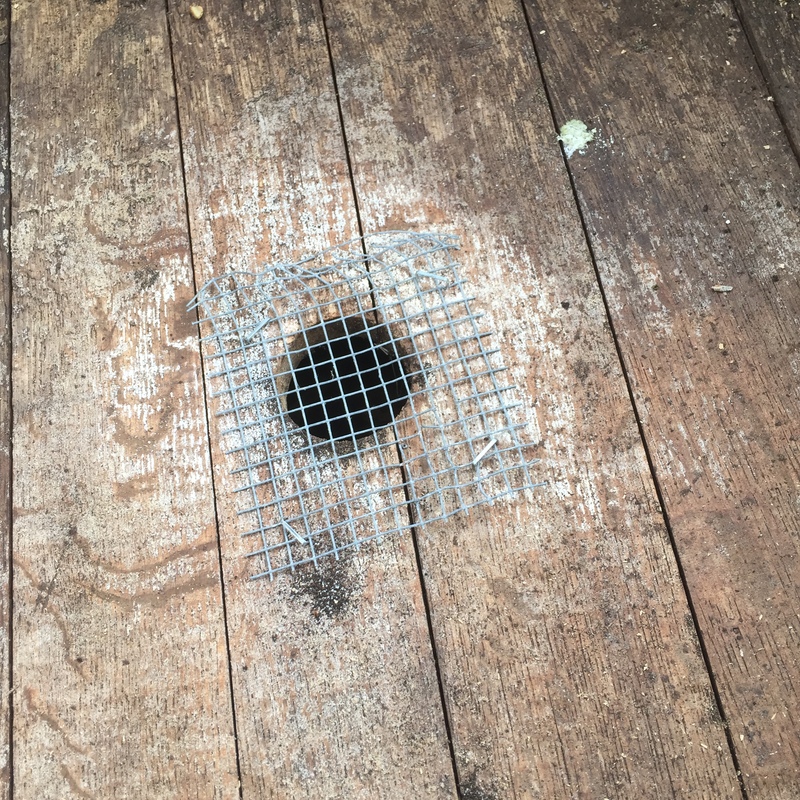 I covered the hole with a wire screen and as seen in the next photo, covered with gravel before adding soil. 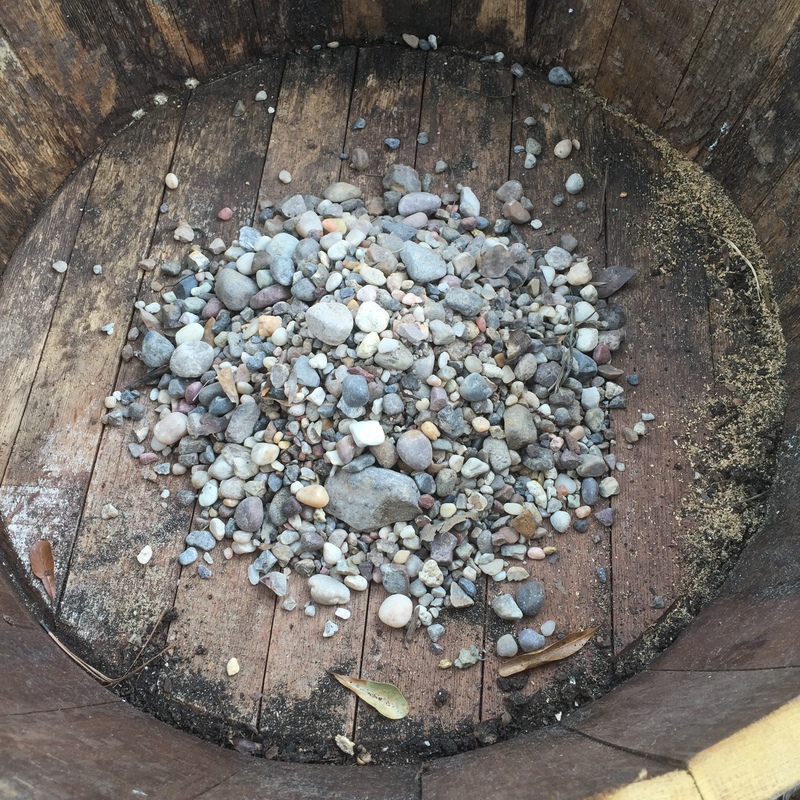 I piled a small bucket load of gravel over the hole to aid in retention of the garden soil…..I suspect it will work well. The first half barrel has been planted with strawberry plants destined to provide luscious red berries for next spring’s jam making. The remaining barrel sits ready and I am waiting for the boss to tell me what to plant! Yes dear, I am listening! Bonus question……Where does TTFN come from?……hint, think HONEY! I recently built two top bar hives to go along with my large Langstroth hive in my backyard. 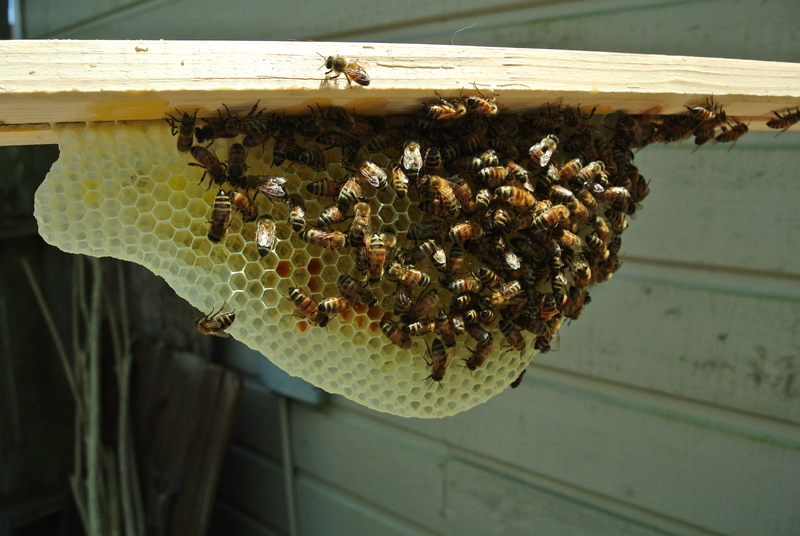 On May 15th I drove over to Navasota, TX, and picked up two packages of bees with health young queens . I installed them that same day and left them pretty much alone for 9 days or so. I inspected to ensure that they were building straight comb and in the orientation that I wanted. “Yessiree they were doing good. Today, June 1st and I opened them up again to see how they were progressing. I am again impressed. 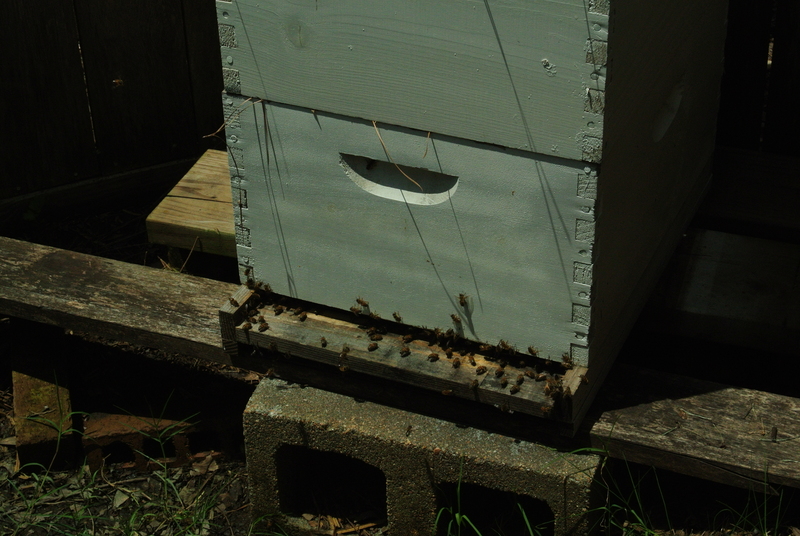 They have built out to the 5th bar on both hives and appear to be happy. Below is a picture of bar 5 in my hand. They are building comb on the wax base strip I added. On most of the top bars a routed a 3/8 inch wide slot about 16″ wide, centered in the 19″wide top bar. 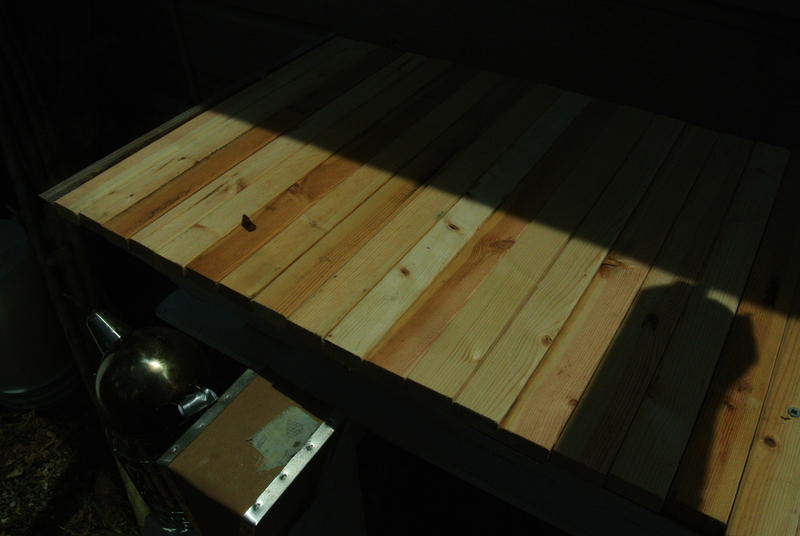 On 6 bars for each hive I switched to a 1/4″ router bit and did the same. In the 1/4″ groove I used some beeswax cell material cut into a narrow strip and used hot beeswax to hold it in place. It appears that they are using it as a reference. I spaced out the bars with the base material alternating the standard bars with the 3/8″ grooved. On the3/8″ grooved bars I have a 3/8 X 3/4 spline glued into the groove and painted with melted beeswax. It appears to be working. Top bar number 4 is really looking good! Sorry about the washed out photo….flash was a bit too bright. Nearly full width and deep into the box. Sun was a little bright and the flash washed it out a little. The second TBH was almost identically drawn out so I didn’t photograph any of the comb. The next photo shows the top of the hive with the corrugated plastic roof removed. The bars fit flush across the top made of standard 1X2 lumber so replacement parts won’t be a problem. The bees were gentle and quiet. I did use my hood and a little smoke but no gloves. Soon…I will share a story of my stupidity and a veil filled with angry bees. Wonderful lesson learned. Tomorrow is my planned day to open the Langstroth hive and extract honey. The two top medium supers are packed full and I should have a bountiful harvest. Base entrance to the hive…very busy and they seem to be enjoying a sunny day without rain! Me too! The garden has slowed down at the end of a long hot summer. All of the tomato plants have been pulled save one. It looks like I may be able to squeeze out a couple more “maters”. The asparagus patch is over head high with ferns and if I peek under the foliage I can still find a few spears to snap off and eat as I work. I shared one with a visitor last week and she couldn’t believe how sweet the spears were! I have carrots coming up, beets have sprouted, the sugar snap peas are climbing, strawberry beds are looking good and my two banana trees have started to dominate their locations……not sure if they will become permanent members because of their size. One of then is a bit unique, a manzano (apple) banana. I have also heard it referred to as a manzanillo….Regardless of the name, I am told that they are very sweet. I used my wood lathe to turn a dibble; From Wikpedia – “A dibber or dibble is a pointed wooden stick for making holes in the ground so that seeds, seedlings or small bulbs can be planted. Dibbers come in a variety of designs including the straight dibber, T-handled dibber, trowel dibber, and L-shaped dibber. ” I found some images on my internet search and I must say….some people can turn some very nice ones….Mine was a quick utilitarian effort….it works and was sized to match the plugs! 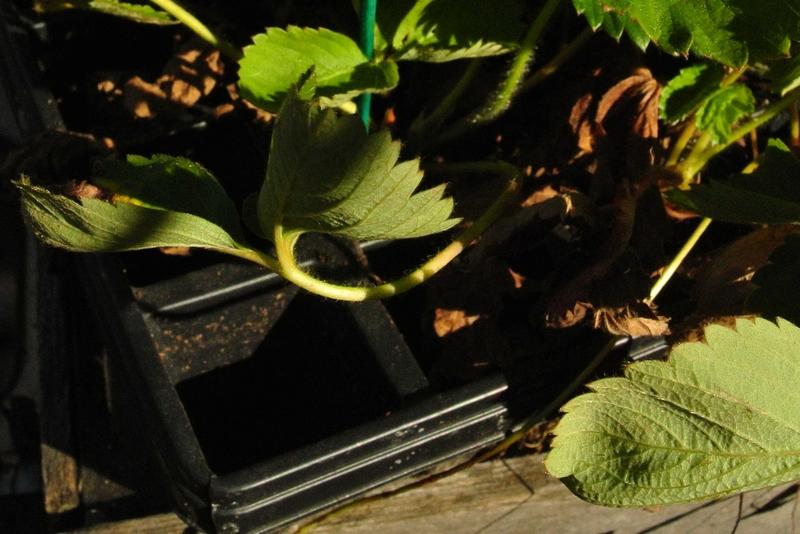 The strawberry towers are filled and I can’ wait for the February/Spring crop! My home made dibble sized for the strawberry plugs. 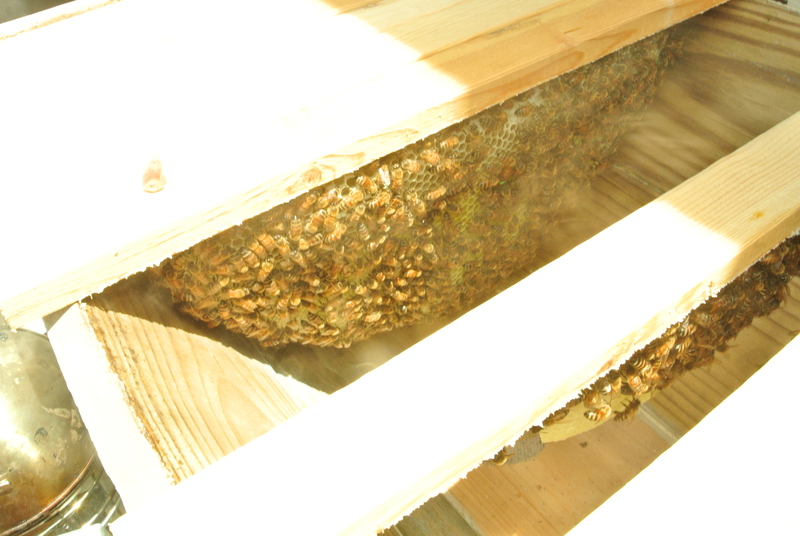 My beehive is humming along…..sorry about the pun! The mouse guard is in place for the winter and has obviously kept the fat toad out of the hive. My daughter had seen him hanging out near the entrance but I actually found him nestled inside with his head poking out through the entrance….wonder how many he ate! I shooed him away and installed the barrier. Paused for a week…..computer issues and then one of my many trips to Williston, North Dakota. Now, about those very dirty hands. I had ignored my composting worms for too long. The drain off the bottom of the bin was plugged up and I knew the bottom tray was probably getting saturated. Oh yes, absolutely full. No problem, I made up a 5 gallon bucket of worm compost tea. I fed the majority of the tea to the newly planted strawberry pugs now thriving in the strawberry towers. My sugar snap peas are starting to climb but appear fragile. I harvested about 4 pounds of worm poop and spot fed the peas as well as giving a good dose to my asparagus ferns. I am very hopeful for a huge asparagus crop next spring. My wife had the paper shredder fired up taking all of the probable confidential mail to create worm bedding. The identity thieves will certainly have a tougher time putting the stripss back together. I also use the worms to take the ground up eggshells and make some calcium rich fertilizer. Between the worms and my big outdoor compost bins I send very little to the landfill. Now wash hands thoroughly and make a sandwich with my homemade sourdough bread. Later on today I need to make the sourdough sponge for tomorrow’s baking day! 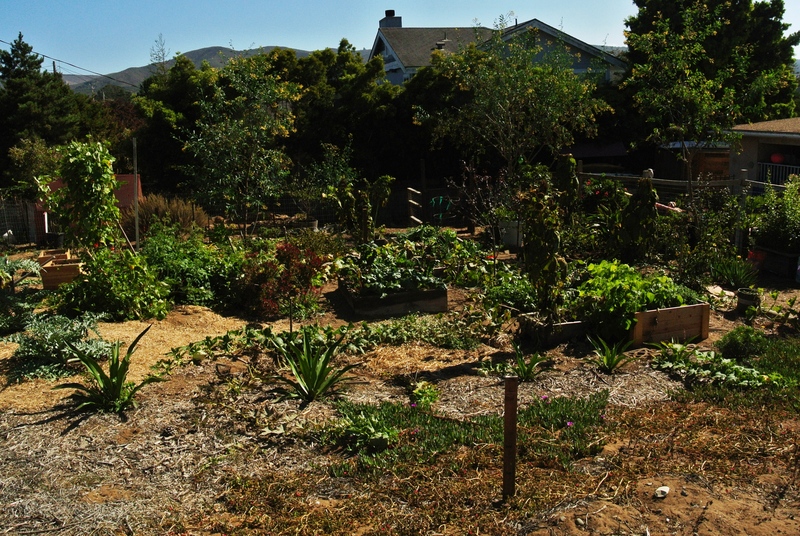 Los Osos, a little town near Morro Bay and San Luis Obispo, is gardener’s paradise. It has that Goldilocks weather, not too hot and not too cold, it is just right. 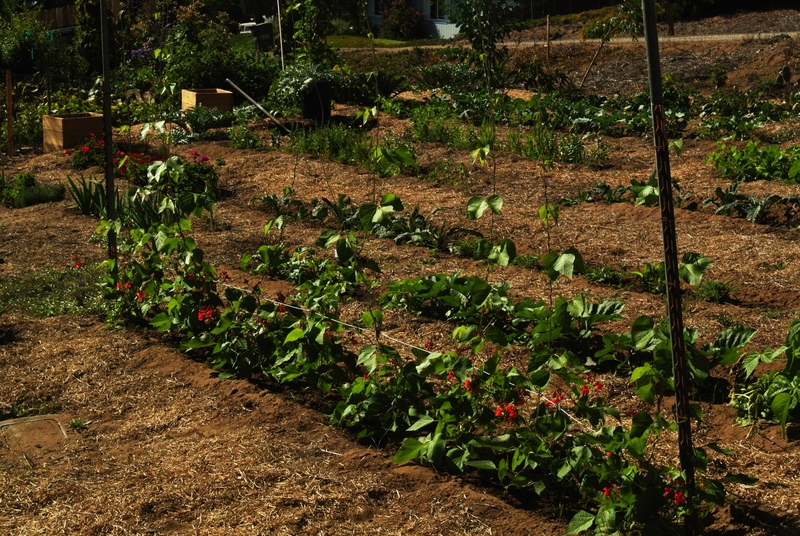 The soil may be a bit on the sandy side but add some compost and it will drain well and produce amazing crops. I have been wanting stop and look at the corner lot in town near my mother’s place for several years and finally decided to stop and look. It looks a lot like my hair on a windy day, disheveled yet remnants of a part still visible. There is obviously a plan but the owner of the plot, I am sure, never worried about staying in the lines while coloring. Cool weather crops can pretty much be grown here round and warm weather crops benefit from the warm sun and soil after the morning fog rolls back. 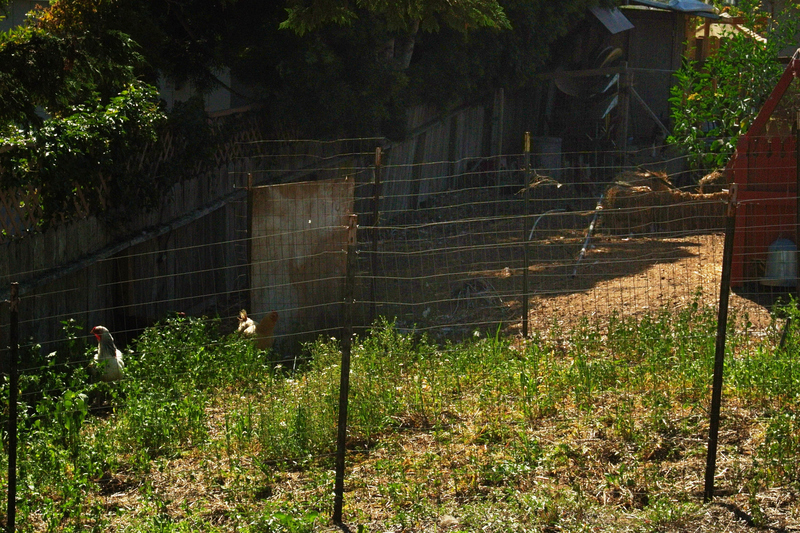 By stopping and looking, I noticed his “girls” in the fenced run at the far side of the garden. Looks like 8-10 well feathered hens of various colors and varieties. I am certain that they produce some tasty and beautiful eggs. 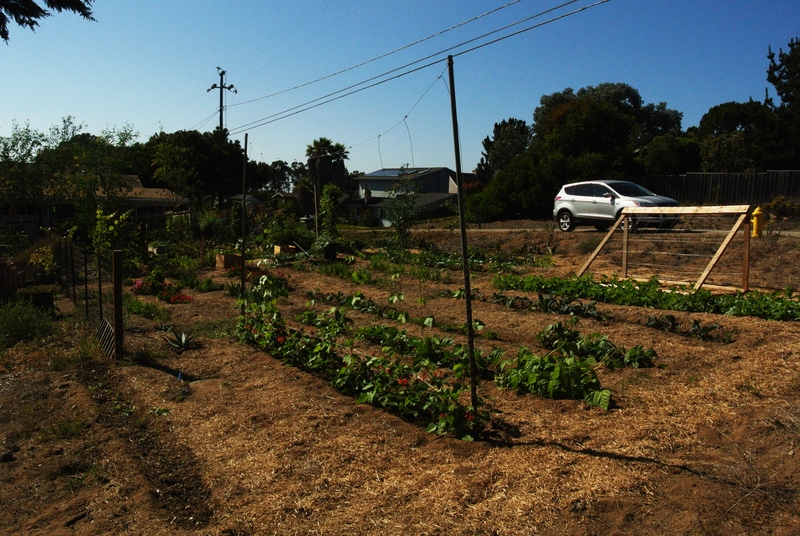 Buying a lot in Los Osos to vegetable garden would probably not payout in several lifetimes. Unless, of course, it was inherited from way back when they were begging people to buy lots there in the 60’s and possibly earlier. I have tried to talk my mom into allowing me to put in some edible borders at her place but I haven’t convinced her yet. Yes, the cost of water in this extended drought they have been facing is a real concern, we could use drip irrigation. Whaddya say Mom? From this angle it looks disheveled, yet interesting! Now I see some organization and pretty decent spacing. Looking back toward the street . Look closely and you can see a few of the girls. I am going to use this as a model for my fall peas!